Today the Afghan president put down the gloves. 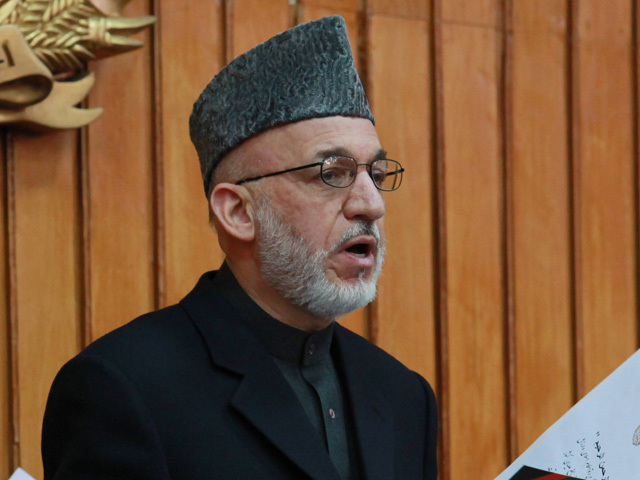 Hamid Karzai was in a reconciliatory mood at the inauguration of the parliament. Over the last week he sparred with elected lawmakers threatening to delay the opening of the lower house for a month to wait for the findings of a special court he had set up to investigate election fraud in September's parliamentary vote. Lawmakers fought back, arguing that the new court was unconstitutional and just a means to eject Karzai opponents from their seats. They threatened to open the parliament without him. President Karzai eventually backed off and agreed to open it but after the very public fight, Karzai seemed battle weary. He offered an olive branch to the parliamentarians calling for unity and quoted John F. Kennedy's famous line: "Ask not what your country can do for you, but what you can do for your country." He also took aim at the international community saying, "There were foreigners trying to show the last presidential election was illegitimate to the people, and also the second parliamentary election was started with the interference of outsiders and also show the process illegitimate to the people. We must work to make everything - especially the election process - Afghanized." This verbal attack on "foreign powers" could be in retaliation to the U.N., U.S. and NATO countries backing lawmakers rather than the president over the opening of parliament. With a growing number of critics from the international community and within his own parliament, President Karzai may be feeling like his back is against the ropes.